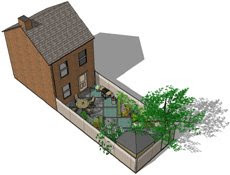 We are currently working on a range of new SketchUp walling components for our Garden Design Pro software, which should be ready for members to download in the next week or so, including dry-stone wall effects, modern contemporary walls, natural pitched stone walling and traditional brick. After just over a year, it's time to hand The Garden Network to someone new, as I'm expecting another child, so will soon be looking after '2 under 20 months' very soon! So with my hands full running Toddington Manor's gardens, our courses and tours, plus Applegate Gardens and Garden Design Pro - something has to give! As of the 27th of March, Tim Matcham of Tim Matcham Garden Design, Wiltshire will be running the TGN website. TGN has been great fun to get off the ground, the first and easily largest of its kind - unique in the professional way its members have participated and contributed, including the established trade associations. I was happy to hand the site over to Tim, because he intends to continue in its original guise of a FREE website, helping small businesses and homeowners to meet, network and improve gardens. TGN has grown very quickly in the last 12 months with a peak of over 100 new members signing up in just one day from approx 1,000 unique visitors, and nearly 8,000 members in total. It really shows whats possible by organic growth on the internet, without advertising, any PR, 'dirty-tricks' campaigns or traditional press coverage - just an original concept, professionally managed and exposed to a large online audience. Long may it continue! Good luck to Tim and all the best with TGN, hopefully everyone will make you feel welcome! All our Garden Design Pro software members can now download the FREE e-book by leading garden designer, author and TV presenter David Stevens. Garden Design Pro's 100th client! 8 weeks has flown by since launching Garden Design Pro and we have just welcomed our 100th client! We are continuing with development of the software, and have more SketchUp components due for release next week. We are also in the process of migrating our 'Latest News' area's to one central, easily managed Blog - so you can keep up to date with all our news and developments with the software, ready-made garden designs, border planting plans, free downloads and more.